Formwork for beams. 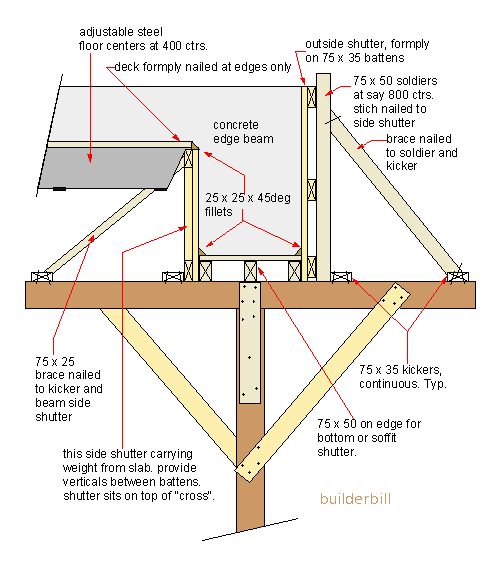 This particular page shows a low tech all timber method of forming a perimeter beam to a suspended slab. An angled member working in compression only. Used to stiffen, straighten or support shutters etc. A member parallel to the shutter being supported, hard up against the shutter and fixed to the support. A member parallel to the shutter being supported but offset from the shutter to allow for the fixing of braces. The sketch above shows a cross section through the formwork for for a perimeter beam to a suspended slab. The props are all timber in the traditional low tech manner adjusted with fox wedges, but if the materials are available then steel props or steel shore frames would be used with a similar layout for the beam itself. Also shown is the use of steel floor centers. These are rarely seen these days and timber joists are commonly used.